The area that surrounds an electrically charged particle has a property, that is referred to as an electric field. This exerts a force on other charge,s or electrically charged objects. It was Faraday who introduced this concept. An electric field is expressed in Newtons per Coulomb when in SI units. It is also equivalent to volts per meter. Field strength, at a given point, is described as the force that is exerted, with a positive test charge of +1 coulomb place, at that certain point. There is no way to measure field strength without the test charge, because ‘it takes one to know one’ when it comes to electric fields. An electric field is considered as a vector quantity. The strength of such field is related to electrical pressure called voltage, and the force is carried through space from one charge to another charge. When a charge is moving, it does not only have an electric field, but a magnetic field as well. This is why electric and magnetic fields are always associated with each other. They are two different fields, but not a totally separate phenomena. Another term of reference has resulted from these two fields ‘“ ‘electromagnetic’. The charges that move in the same direction produce an electric current. As was earlier mentioned, moving charges create a magnetic force. Thus, when there is an electric current, there is a magnetic field present. The magnetic field’s strength is expressed in Gauss (G) or Tesla (T). Magnetic materials have magnetic fields around them, which are considered inherent. Magnetic fields are detected due to the force they exert on magnetic materials and other moving electric charges. The magnetic field is also considered as a vector field, as it has a specific direction and magnitude. An electric field has a force proportional to the amount of electric charge within the field, and the force is in the direction of the electric field. On the other hand, force of the magnetic field is proportional to the electric charge as well, but also takes into account the speed of the moving charge. The magnetic force is perpendicular to the magnetic field, and the direction of the moving charge. In electromagnetism, electric and magnetic fields oscillate at right angles to one another. It should be noted that each can exist without the other. For instance, Magnetic fields without an electric field can exist in permanent magnets (objects with inherent magnetism). Conversely, static electricity has an electric field without the presence of a magnetic field. The interaction between magnetic fields and electric fields are laid out in Maxwell’s equation. 1. An electric field is a field of force, surrounding a charged particle, while a magnetic field is a field of force surrounding a permanent magnet, or a moving charged particle. 2. The strength of an electric field is expressed in Newtons per Coulomb, or Volts per meter, while a magnetic field strength is expressed in Gauss or Tesla. 3. The force of an electric field is proportional to the electric charge, while the magnetic field is proportional to the electric charge as well as the speed of the moving charge. 4. Electric and magnetic fields oscillate at right angles to one another. Ian F. "Difference Between Electric and Magnetic fields." DifferenceBetween.net. November 8, 2018 < http://www.differencebetween.net/science/difference-between-electric-and-magnetic-fields/ >. XLNT, es lo que andaba buscando, tnks. Thanks for this very useful article. I’d just query the definite statement that magnetic fields can exist without electric ones: the magnetic fields in iron bars, say, are of course caused by electric currents, since that’s the only way magnetic fields can appear. In the case of iron, the electric currents are those caused by electrons moving round in their “orbits”. Thank you for the great article! Very easy to understand and helpful. THIS ARTICLE VERY HELPFUL FOR ME .THANKS…….! Side note that i learned in class today: and Inductor stores energy in magneticfield because of the electrical charge passing through the wires that are rapped in a coil. Capacitors store energy in their electrostatic field which is created by storing charge in electrolyte solution between plates like a battery. Thanks for such a easy and knowledgeable article. Thanks . Very helpfull answar we gotn from your knowledge. Is static current possible/exists…plz explain? Regarding point 2 in your summary; magnetic field strength is NOT measured in Tesla, it is measured in Amps/meter. Flux density is measured in Tesla. 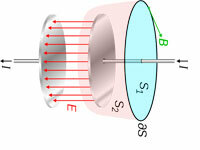 No points are included pointing the the direction of electric field and magnetic field.